Earlier this year, the FIA World Rallycross Championship announced it would introduce electric all-wheel drive rally cars for the 2021 racing season. These all-wheel drive rally racers will help the sport gain an economically friendly image and may also open up new venues to race at due to the low noise of the cars, similar to Formula E’s city center circuits. It’s hip to be eco-friendly, but luckily no on told Pat Moro that. 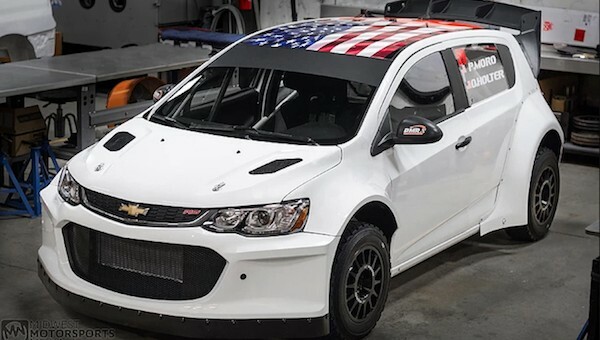 The American Rally Association rallycross driver and his PMR Motorsports crew have built themselves an insane all-wheel drive Chevrolet Sonic rally car with a 6.2-liter LS3 V8 under the hood. 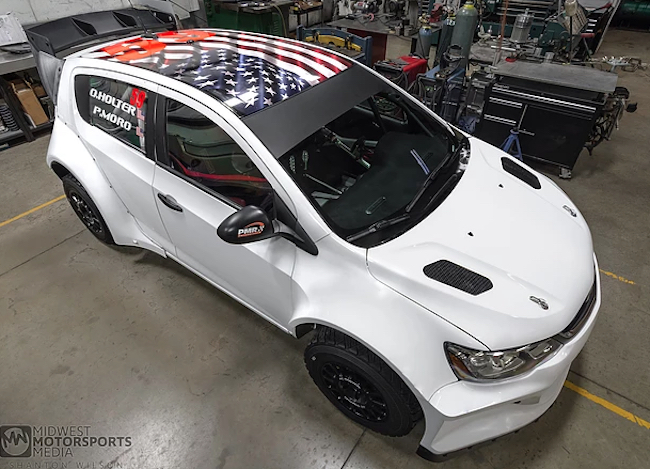 They proudly showed their mad creation off at the recent Performance Racing Industry Trade Show in Indianapolis and intend to go racing with it at various ARA events across the US next year. 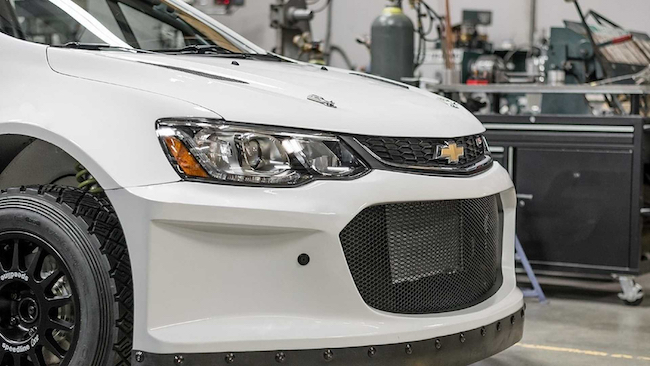 Exact details on the V8 Chevrolet Sonic are minimal, but we suppose the formula here is pretty standard: take all-wheel drive Chevrolet Sonic rally car, drop in LS3 V8 and go racing. We imagine the V8 is much cheaper to run and more reliable than the high-strung four-cylinders most rally cars are running these days and thanks to the Small Block’s relatively compact size, packaging was probably not too big of a headache. A stock LS3 V8 makes 430 hp and 425 lb-ft of torque, so if the LS3 in this mad rally Sonic is stock, it would still move pretty good. We can’t wait to see this thing in action next year. We just may have to go out to an ARA event to watch (and hear) it for ourselves. Watch out, turbocharged four-cylinder rally cars of the world. The 430 hp V8 rally Sonic is coming to drown out your buzzy exhausts with its bassy, hairy chested American exhaust note. Too bad Pat isn’t nearly a good enough driver to make use of the car. Neither will its reliability be up to snuff. So, every event this car completes would make you what? Wrong! I don’t think its the right formula, too much weight, too high in the chassis. Bringing the center of gravity up is not a good thing for any car that has to turn! I don’t think the little turbo engines have any worries with the big bad V8. The EV racers are another matter. More power. Simple drive trains and more reliable. The crate LS-376 makes 525+ hp. I know as I have bought nearly twenty of them. Best performance buy out there.